Iso-ball, for all its associations with acts of heroism in the clutch, is supposed to be a dicey proposition for the guy with the ball in his hands. Sure, it has created some cinematic shots throughout the years, but its defining trait is its inefficiency. Iso-ball is a tactic that’s more defined by contested, clanked jumpers than pure ones, and it’s a disease of the ego that teams and coaches have spent years trying to eradicate from the game as they sought out more efficient results. None of these truths apply to the Houston Rockets, or more specifically, to James Harden. During last night’s 115-111 victory over the Blazers, Harden demonstrated all the ways in which he’s turned iso-ball into his personal torture device. He scored 42 points on 13-of-25 shooting, and he scored those points in some of the cruelest ways possible. 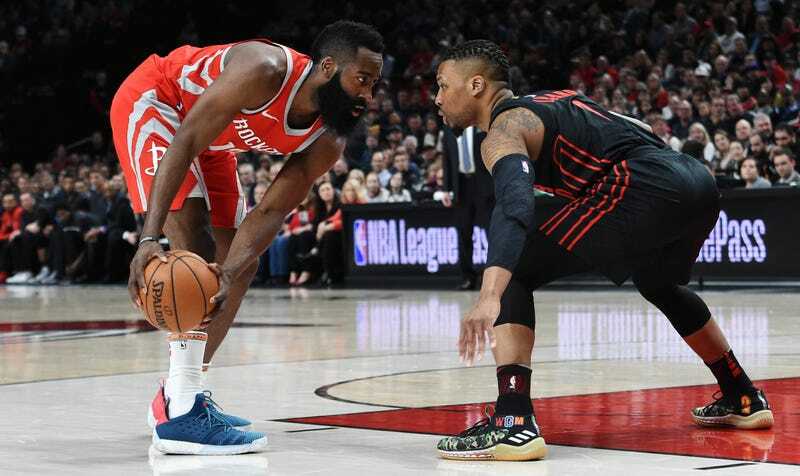 The game unfolded as a series of discrete duels between Harden and whichever doomed Blazers defender had drawn the short straw on a particular possession. Harden would drag his man out to the perimeter while his teammates spread the floor, casually dribble the ball while the shot clock ticked down, and then unleash a crossover followed by a clear drive to the hoop or a step-back jumper that no defender without the benefit of a weapon could ever hope to stop. It’s been like this all year, of course. According to NBA.com, Harden uses 9.6 iso possessions per game, and scores 1.24 points per possession on those plays. That makes a James Harden isolation more efficient than most spot-up three pointers. This all works because of Harden’s singular ability to manipulate defenders and exploit the tiniest pockets of space, and also because the Rockets have given him all the room he needs to operate. He routinely shares the floor with three or four shooters who stand as far away from him as possible. Their defenders can either stand there and watch as Harden puts one of their teammates in a slow cooker, or they can try to help out and leave a dead-eye shooter open for Harden to pass to. There’s really no good option here, as the Blazers found out last night. More often than not, James Harden is going to beat you, and he’s going to be really rude about it.